The warm spring weather makes me want to get up and stretch. Apparently the girls feel the same way because this week the Bee broke out our copy of Babar's Yoga For Elephants and has been trying out some of the poses all over the house. We have never done any formal yoga, but we have a few children's yoga books that we break out from time to time that inspire us to do a little stretching. 1) Babar's Yoga for Elephants by Laurent de Brunhoff- The lovable elephant Babar tells kids a little about the history of yoga before demonstrating a variety of yoga poses and movements. This book has a great explanation for sun salutations. 2) Yoga Pretzels by Tara Guber- This pack of over sized, laminated cards are great for kids who want to try out some yoga poses. Each card has an illustration of a pose as well as some info about the pose. The cards are broken up into categories for grown-up reference. However our favorite thing to do is dump all the cards on the floor and try out the different poses. 3) Little Yoga: A Toddler's First Book of Yoga by Rebecca Whitford- A really great book for the littlest yogi, this book has pictures of young children doing the different poses. The girls love to look at this and imitate the poses they see. I think they can really relate to this one since the kids in the book are their age. 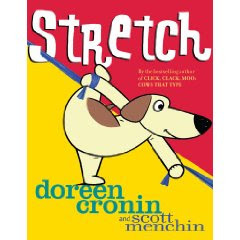 4) Stretch by Doreen Cronin- A story about a dog who does all kinds of stretching. We love this story and my favorite part is that without fail within just a few pages my kids are up doing the stretches too! Does anyone else have any good kid's yoga book recommendations? Or any suggestions for doing yoga with kids?